Cryptograms, also called Crypts, are coded messages in which each letter is replaced throughout by another letter wherever it appears. The term for this is a simple substitution cypher. This means of encoding data goes back at least as far as the Romans although, today, it is suitable only for entertainment. This page provides a brief introduction to cryptograms for both solvers and composers. 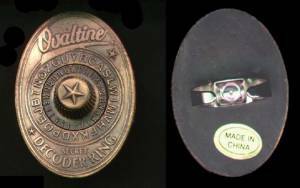 A common example of cryptograms was the “secret decoder rings” of the past which consisted of a fixed alphabet and another alphabet that could be rotated (see the example of an “Ovaltine Secret Decoder Ring”). Those familiar with computers may know the term “ROT13,” which is a specific type of decoder-ring cryptogram where the letter A on each alphabet matches up with the letter M on the other, so each letter is replaced by the letter 13 characters away. No letter may stand for itself – all letters must be changed. No letter may represent more than one other letter. All punctuation and original word divisions are retained. Capitalized words are tagged with asterisks; thus, Lily Tomlin might be encrypted as *EGEC *YQNEGM; Richard III might be encrypted as *WSOTUWV *S*S*S. (This doesn’t apply to words that are capitalized only because they begin a sentence.) Words that are capitalized only because of their usage are tagged with carets: ^Uncle *Remus, ^The ^Mill on the *Floss. For example, the message “Meet me here at two o’clock, or else!” might be encrypted as PXXF PX AXJX HF FIZ Z’DKZDU, ZJ XKOX! What makes a cryptogram hard to solve? Uncommon words are a common plan. The less recognizable a pattern, the tougher it is. Common patterns; Book, tool and moon would be hard to decode. Adding reel, rook and room would be a challenge, too. Isomorphs – words that never use a letter twice – can be as hard when, for example, all the words are also six letters long. Skewed letter counts. Everyone knows “E” is the most common letter in normal English writing. Cryptograms are not “normal English writing,” though. You can expect the uncommon letters to be more frequent. Composers will avoid contractions and the pronoun “I,” as well as the article “a.” These all leave one or two letters that will allow you to break into the puzzle. What makes a Cryptogram interesting? Almost all the things that make a Crypt challenging also make it interesting. Note that, if XYZ were used in the crypt, it would not be legal since they “stand for themselves.” What makes this solution interesting is that the composer has used a specific word to encrypt the solution (Nightowl). This is reported to have been used to help prevent decoding messages; one messenger would carry the encoded message on paper, another would deliver the keyword by another route; without the keyword, decoding the message would be more difficult (but nowhere near impossible).